Any agronomic analysis tool such as OMP relies fundamentally on the quality and trustworthiness of the basic data that is input into the database. In an oil palm plantation, some kinds of data can be collected relatively reliably and easily using various kinds of automated or semi-automated measurements. Typical examples would include weighbridges with automatic digitalization of production data, automatic weather stations, or more recently automated palm counts using LIDAR, drone or satellite imagery. However, many crucial kinds of field data, in particular relating to field upkeep standards, harvesting performance, nutrient deficiency scoring or pest and disease monitoring still require manual evaluation and scoring by trained survey personnel in the field. The large scale of a typical oil palm plantation offer up a number of specific challenges in this regard. As there may be multiple surveying teams within a plantation (and even more within a larger company or group with multiple plantations), one main issue is to ensure that questions, criteria and measurement techniques are standardized and clearly communicated to all surveyors. This is critical in order to reduce the subjective nature of the collected scores as much as possible. A second problem is to ensure that data is being collected at the correct locations within each block, e.g. some surveys should be carried out at designated LSU palm locations, others maybe at fruit collection points or along harvesting paths and so on. Closely related to this, in some cases it is necessary for management to be able to check that surveyors have really visited the prescribed locations and did not simply hand in surveys with fictional data, particularly for locations that are hard to reach. A third major issue is how to process and aggregate the raw data collected at many individual points within each block into meaningful data at block level. Many surveys are still carried out in paper form today, in which case the process of simply digitizing the results can be a significant amount of work, in addition to being prone to transcribing errors. 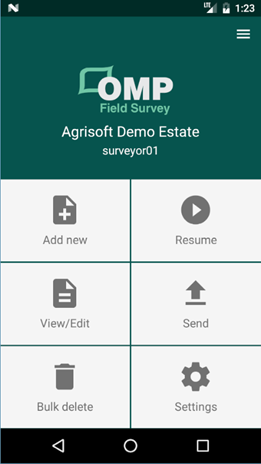 The new OMP Field Survey add-in (OMP-FS) and associated survey app for Android tablets or smartphones is a powerful tool to help tackle the issues outlined above. As data can be recorded in electronic form directly in the field, the need for any transcribing of paper survey forms is eliminated. Standardization is enhanced because all survey parameters are defined in a unified manner in the OMP-FS add-in. A key aspect in our program design has been a focus on flexibility, as field conditions and thus surveying requirements may vary widely for different plantations. The fundamental object in OMP-FS is an individual survey question. A question definition includes specification of the parameter to be surveyed, the type of entry control used to enter the data in the survey app, data types, bounds or allowed responses as well as information on how the results are to be aggregated up to block and higher spatial levels. When defining a question, it can be either based on an OMP field (see figure 1) or completely user-defined (figure 2). For OMP questions, all definitions, including any pick-up list values, are automatically taken from your main OMP data set. This guarantees that the resulting data will have the correct shape to be able to easily write the results into your main OMP block data set, which is the main advantage of an OMP question. User-defined questions on the other hand allow full flexibility in the definitions; however, the resulting data will not necessarily be directly importable into the main OMP block data. 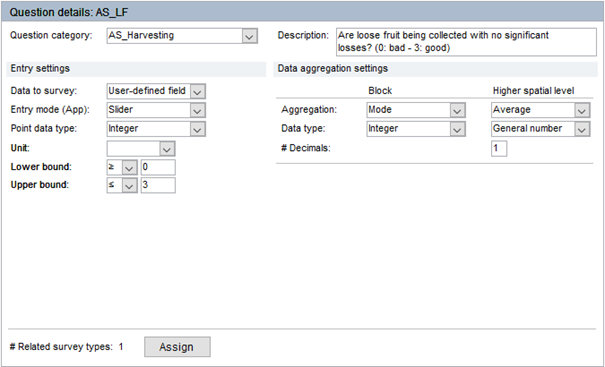 Of course, even if there is no matching OMP field you can still aggregate and analyse the results within OMP-FS. Figure 1: Details of a question linked to an OMP field. Figure 2: Details of a user-defined question. Once questions are defined, OMP-FS allows you to combine multiple questions into a so-called „Survey type“, which defines which questions are to be surveyed together during a single field visit. It is also possible to mark certain questions as „required“ within a survey type, in which case the surveyors will not be able to save a result with the OMP Survey App for this survey type unless all required questions have been answered. Surveyors may be grouped into surveyor groups, and it is possible to limit a list of surveyor groups that are assigned to any given survey type, to avoid that certain types of surveys are carried out by unqualified or unsuited personnel. All definitions are transferred between the OMP-FS add-in and the Survey App via encoded text files which can simply be sent via email. The same technique is applied in reverse to send survey results from the app back to the OMP-FS add-in. Once definitions have been imported into the app, surveyors can log in, choose a survey type and start surveying with just a few taps (see figure 3). The survey entry screen displays a list of all questions for the selected survey type (figure 4), with data validation built in and the entry control matching the question definition made in OMP-FS. Figure 4 shows only two options for question entry types („slider“ and „picker“), various other options are available including free entry textboxes, „steppers“ for counting things or simple buttons for yes/no questions. Figure 3: OMP Survey App main menu. Figure 4: OMP Survey App questions form. For questions of type „picker“, responses are chosen from the list defined in OMP. All question details can be viewed using the details button, including detailed descriptions of bounds or the criteria that correspond to each possible allowed response value. Apart from helping to standardize questions and responses and eliminating the need for transcribing paper results into electronic form, the OMP Survey App can also help with the other problem mentioned above, namely ensuring that surveys are carried out at the correct position and locations are recorded correctly. For cases where results are to be taken at certain predefined points within a block, OMP-FS allows you to predefine lists of such points for each block. There are four different categories of predefined points: palm points, fruit collection points, harvest paths and other special points (to be used for special points that do not fall into the previous categories like e.g. bridges, culverts etc.). Palm points can be further subcategorized into user-defined groups such as LSU palms, BBC palms and so on. All predefined points can be georeferenced and, depending on the point type, may have some additional information such as a palm row and number. The definitions file sent to the app includes the list of blocks and all predefined points. When entering a new survey results at a predefined point, users can choose the division, field, block and point ID from the relevant lists, reducing errors of mistyping (see figure 5). This can be even further simplified if you label special palms with cards showing a QR code with the relevant location information (see figure 6) for a sample code. 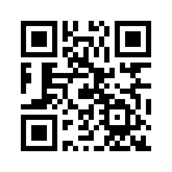 The OMP Survey App can then simply scan this QR code and fill in the information automatically. 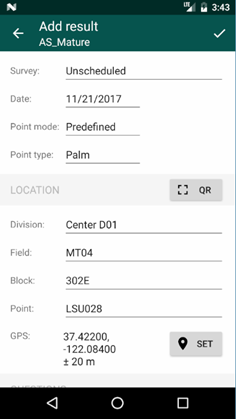 Because OMP-FS allows you to see whether a point was scanned or entered manually, a system using such QR cards has the additional advantage that surveyors are really forced to go to the palm location to scan the code, i.e. there is no possibility of entering results without actually visiting the palm. Figure 5: Survey point location for a predefined palm point. Of course, for some types of surveys it is also possible that the survey points are not known in advance (e.g. surveys looking for palms affected by a certain disease). In this case you can switch to „free entry“ point mode, in which case the point can be identified by a freely typed palm row and number or by a unique name, as required. Finally, OMP-FS also supports a point mode „block“ which may be used whenever you want to take a single result valid for the block as a whole and does not belong to any particular point within the block (e.g. an overall count of diseased palms in the block). If your survey device supports GPS, it is straightforward to also record the GPS position at which the survey result was taken using the „Set“ button visible in figure 5. If you want, a reminder can be activated that warns users if they are trying to save the survey result without having taken the GPS position. Note that this GPS information is supplemental and independent of any geocoordinates which may have been entered as part of the definition of a predefined point. This means they provide an independent check that the survey results were taken at the correct locations. If desired, survey point geolocation data can be easily exported from OMP-FS in Excel format for mapping with any type of GIS software. No matter what type of points the survey data is collected at, having multiple data points per block raises the question of what value for a given parameter should be assigned to the block as a whole. This is particularly important as most field management as well as almost all analysis within OMP works with block-level values. One of the most important functionalities of OMP-FS is that all survey data is automatically aggregated up to block, field, division and estate level according to the aggregation modes defined for each question. Points are grouped for aggregation either by explicitly assigning them to named „scheduled surveys“ or simply based on the survey date spread in the case of unscheduled surveys. This automatic aggregation is one of the core features which sets OMP-FS apart from other survey apps which are not custom built for the purpose of field surveying in oil palm plantations. Figure 7: Analyzing aggregated results. While this aggregation is already a very powerful feature for data analysis, it can also be useful to go one step further and consider calculated data which is not surveyed explicitly but which instead is calculated from the aggregated results at each spatial level. OMP-FS allows the user to specify completely general expressions or calculation formulae that are used in this manner to compute derived values from the aggregated data. One main use case for expressions is to calculate summary scores from multiple questions, such as for example an overall harvesting score for the block which is calculated from three individually surveyed questions on loose fruit collection, bunch harvesting and bunch collection. Another use case is to convert raw survey data into a form suitable for import into OMP. An example of this type of expression is shown in figure 8, where the raw survey data is a count of the number of palms affected by a certain pest or disease outbreak, and the expression converts this into a severity score of 0, 1, 2 or 3 depending on which percentage of palms in the block is affected. Figure 8: Sample expression for an effective severity. 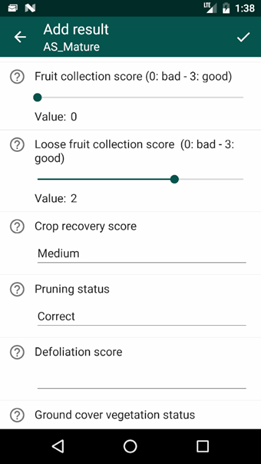 Overall, OMP-FS and the Survey App offer a flexible integrated solution to the problem of collecting field data in oil palm plantations. With built-in aggregation and expressions, it even goes one step further to help you transform raw survey results into meaningful information that can be translated into explicit management actions for yield improvement.